Team building brings people together by encouraging collaboration and teamwork. One of the most powerful reasons for team building is to get results. Through activities that are fun and motivational, teams build skills like communication, planning, problem-solving and conflict resolution. These activities increase the overall performance of the team. 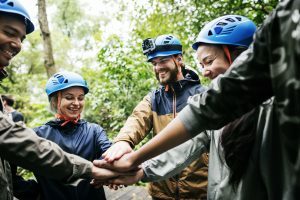 Team Building exercises increase the trust factor among the employees. The productivity increases when individuals work as a team. Team Building activities also reduce the chances of confusions, misunderstandings and making the communication effective. Team Building activities bring employees closer and one feels happy to go to work daily. The in-house training sessions have more than 70% activity based experiential learning methodologies incorporated. The participants are involved in activities that require them to work as a cohesive unit. This facilitates learning of concepts through discovery. The concepts thus learnt are then correlated to work place situations through role plays. Outbound programs are very effective in improving collaboration between the team members. These facilitate learning the skills of communication, leadership, time management, problem solving, decision making, motivation, change handling, teamwork, team bonding and personal development in an environment away from the regular work environment. Unfamiliar environment, unpredictable situations with challenges to be met as a team brings to front the strengths and trouble areas and suggests new coping behavior. The program is conducted at locations that are suitable for other corporate events so that outbound training can be delivered simultaneously with other events. Contact us here to organize an outbound training for your company.